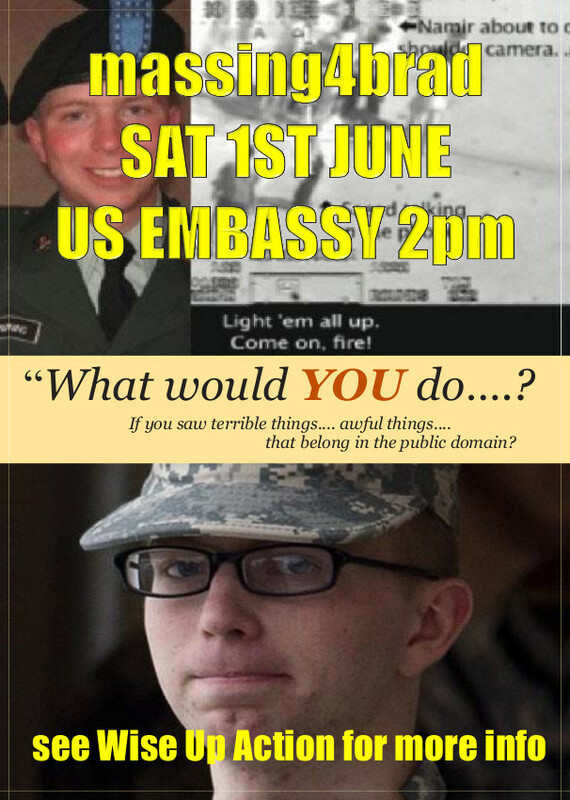 SAT 1ST JUNE US EMBASSY: DEMONSTRATE! CRAIG MURRAY whistleblowing ex British Ambassador, human rights campaigner, expert on the so called War on Terror and the security state. GUY SMALLMAN photo-journalist. Guy is the only western journalist to have visited the scene of the Granai massacre. plus there will be more music from the amazing JOHN McCLEAN and others! other contributors from Payday Men’s Network, Queer Strike, London Catholic Worker, Queer Friends of Bradley Manning, Wales for Bradley, Young people of West Wales for Bradley Manning, Naomi Colvin &c plus open mic. 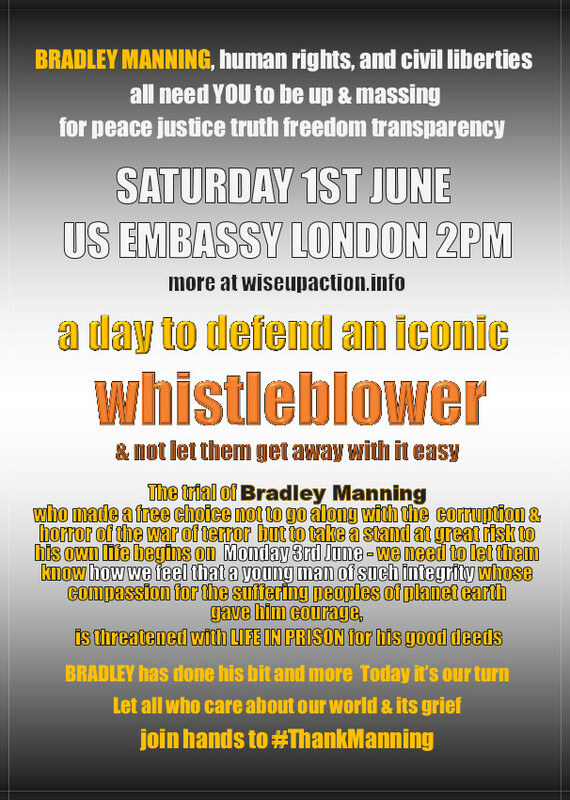 Please come and make YOUR voice heard as well in defence of this iconic whistleblower. Many groups and people have reason to be grateful to Bradley Manning for revealing the truth as it relates to their struggle – we urge you all to join together with us on this day and #ThankManning! 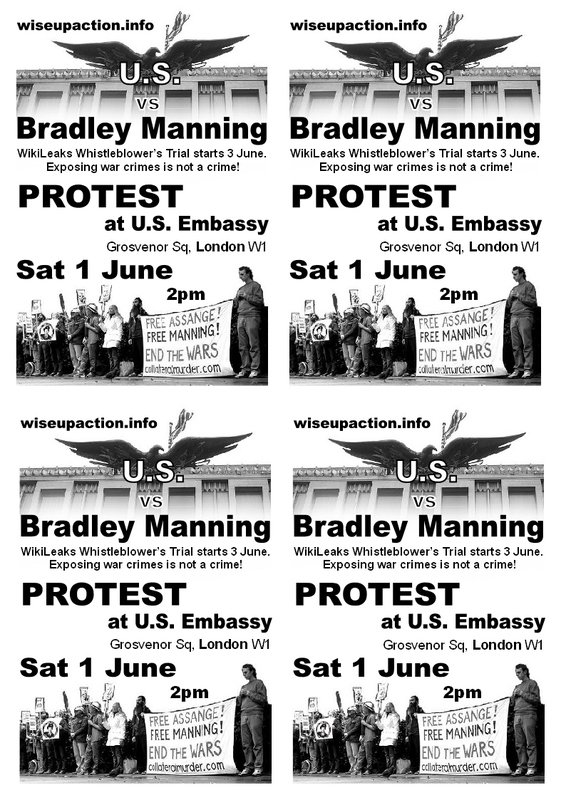 We hope to be joined by representatives of various campaigns for Justice, Peace and Freedom on this day when we will be celebrating Bradley’s act of resistance, the effects of which are ongoing and an inspiration to us all.